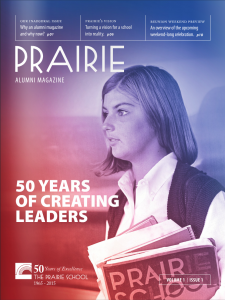 The weekend of June 4 – 6, The Prairie School hosted a series of events for alumni and friends in celebration of the school’s 50th anniversary. Guests traveled near and far to attend festivities on and off-campus including a commemoration of historical Prairie artwork at the Racine Art Museum, an alumni soccer game on the Ruud Family Soccer Complex, cinnamon rolls with Carol Malik and a social at The Red Onion Cafe in conjunction with Racine First Fridays. The weekend culminated in an Alumni Reception & 50th Celebration at Fortaleza Hall on SC Johnson’s campus Saturday night. With approximately 500 guests in attendance, the evening included a live performance from Dominic Miller `78 and a presentation of awards to notable alumni and past faculty members. It was a celebration like no other! Thank you to those who attended and made it an unforgettable weekend. Check out our Alumni Magazine!